Best Price Guarantee, if you find cheaper elsewhere, we will refund the difference ✦ One Stop Shop for your Digital Life! Ask a professional designer from Low Cost Web Agency to create your Twitter cover for your account. This will allow you to mark your difference with the others and to rank above your competitors with your new professional Twitter cover! Just as Facebook, Twitter is a very well known social network. However, its usage is quite different as it can help you in achieving some different objectives. A Twitter account allows you to manage one page showing news about you or your business. Nowadays, companies use Twitter to spread business opinions and ideas. Your Twitter cover pic is the first step to set up a high quality profile and distinguish your business from others. We help our customers in taking advantages of Twitter. You can get in touch with your customer simply : communicate with them, get their feedback, measure their satisfaction, and in result, manage your e-reputation and Branding. Twitter can be considered as a powerful customer service tool. Keep in mind that you need a Twitter account to expand your business and get informed about the latest news published by your competitors. It is an excellent tool for benchmark the best-in-class players and do Economic Intelligence. Making your business identifiable by all is the key for success… Contact us to make the difference together! Low Cost Web Agency… all that you need! We provide you all our expertise to create your personalized Twitter cover. You can decide if you want the source files of your Twitter cover or if you just need the Web version. 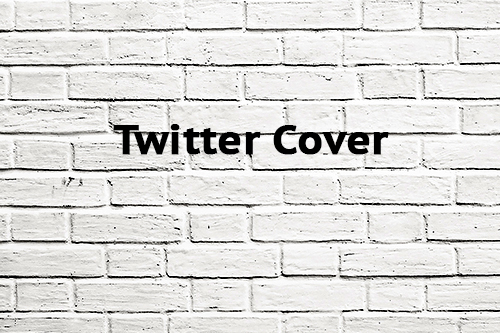 You can ask us to upload your new cover directly on Twitter. Many options are available to fit your needs and allow you to get the price offer which gives you satisfaction. It’s Low Cost Web Agency motto. We want to allow everybody to get a professional image on the web without spending a lot of money. Look at all the different Social Network Cover we can design for you. Do you use Premium Templates? Yes, after your purchase you will select a premium template between thousands possibilities on Themeforest. The use of a premium template is the best choice for 99% of the projects. It allows to reduce the cost of development and maintenance. A premium template is a guarantee to have a very professional output with a limited budget. Our designers will customize the Premium template with your logo, content and images to match your Company image. The price of this Product includes the Lifetime licence of the premium template used to build your design. If you have room with your budget, then you may ask us to develop your design from scratch. Ask us for a custom quotation. Why do I need a domain name and how can I register one? You need a domain name for your website. At Low Cost Web Agency we offer only professional solutions. You can find many free offer to do your site by yourself but you will not have a personal and unique name for your website. You may already have a domain or you can register it by yourself. However our domain offer is very convenient because it includes all the management of technical aspects of your domain name. You can register one ore many domain name only if you buy a product where the option is available. When you opt for Domain name option, you understand that the registration cost indicated is for 12 months. At the moment of renewal you will be asked to pay the same amount for annual renewal. It’s a cost that recurs annually but nothing is done automatically, you will be asked to login and proceed to payment for renewal. You can decide at any moment to stop your domain name. Low Cost Web Agency offers as part of our Web design Services the registration of a domain name on your behalf. Domain name registration gives you exclusive rights to a certain name, such as www.myname.com, so that you can use it for your web-based purposes. You are NOT required to register a domain through us, but as explained before, we strongly prefer that you do, especially when you want your website to be hosted by us. Our company is an official reseller of the registrar Gandi.net. If you ask us to register your domain name on your behalf, your domain name will be registered with Gandi.net. You will appear on the WHOIS database as sole Registrant Contact meanwhile our company will appear as Administrative & Technical Contact. When your domain is registered by us, we supply to you the credentials of your Gandi account. At any moment you can ask Gandi to unlink your domain name from our Company and you remain always the unique owner of your domain name. Where Low Cost Web Agency Pvt. Ltd. registers a domain name on behalf of the client, Low Cost Web Agency Pvt. Ltd. does not guarantee that any particular requested domain name will be available until confirmation has been received from the naming authority. In the same way, Low Cost Web Agency PVt. Ltd. don’t give any guarantee that you are eligible to register a specific extensions. You must check before your order on this page. https://www.gandi.net/en/contracts/tlds what are the Domain Name special conditions if any to ensure you fulfil the requirements. No refund will be granted for unavailable domain or because you don’t fulfil the requirements to register the extension you want. If the domain name indicated by you during the buying process is not available, or its extension is not suitable for you, you must provide us, upon our request, an available and suitable domain name as replacement. In purchasing or renewing domain names on behalf of the client, Low Cost Web Agency Pvt.Ltd. is acting solely as the client’s agent and accepts no responsibility for the continuance or otherwise of that registered domain name. We have no liability for domain names that are not registered by us and associated with your accounts. In order to facilitate your buying process, we have created 3 categories of domain names according to their extension. Each category shows a group of available extension with an unique Registration fee. Before buying any Website Site design, please check what is the category of the domain name you want and select the correspondent category during the buying process. Low Cost Web Agency Pvt. Ltd. will not accept any responsibility for mistakes you can do and will not offer any refund in case you indicate a wrong category during the buying process. Please note that our Domain Services are limited by default to one year renewable. In the event you are interested to register your domain for several years from start, please contact us after you bought our Web Design services and we will extend the validity of your domain name upon successive payment of remaining annual fees. In the same way, if you want to register more than one domain name, as example to protect your name with Country extension, just contact us after buying the registration service of your domain name and we will register the others desired domains upon the payment of the annual fees. If you already own one or many domain name trough your hosting or registrar, you can opt for the transfer of all your domain name under a single account on Gandi.net. As for our registration services, you will appear on the WHOIS database as sole Registrant Contact meanwhile our company will appear as Billing & Technical Contact. You need to ensure before buying that your domain name is transferable (unlocked, enough time before renewal date). In case of doubt please enquire your actual registrar or hosting provider. Please review all the extensions available on https:// lowcostwebagency.com/all-domains-available/ and ensure that the domain name you want is available before buying. You may also look for the list on our Faqs. If you want to register your domain name by yourself, you can use the services of the Registrar Eurodns. It’s a good alternative to Gandi, specially for the registration of geo-targeted Domain name without the need of local addresses. Use the window below to look for the availability of your domain name. Why do I need a Hosting and what are your offers? This cost recurs annually as for domain name registration. Hosting places the domain name on a particular server connected to the web, which allows you to post a website for viewing through a browser. You are NOT required to host through us, but we strongly PREFER that you do. Hosting comes with domain-based emails, bandwidth, storage space, database and security tools, staging features and many others things. Projects that involve custom programming must be hosted with Low Cost Web Agency Pvt. Ltd. to ensure the programs that we write will work. If you want to host your site on another server this must be disclosed before we begin programming and/or selecting the adequate option during the buying process. At any moment you may buy Extra storage Space and Extra emails Addresses. Most probably we will not need because our 2 Hosting options cover 98% of our customers. However if you need a huge server space or even a full server, we are here to help you, contact us before buying with your hosting requirements. The annual fee for 1 GB extra Space is 30$ or equivalent in your currency. The annual fee for 1 extra email addresses is 15$ or equivalent in your currency. It includes configuration and support if needed. Our Hosting service is ensured by Siteground . Your Website/application/Script is hosted on a secured VPS Server. We use lightweight Linux containers with SSD disks for unmatched resource efficiency and site speed. We configure and manage the infrastructure and server software to take off your head the day-to-day IT maintenance. We keep 7 offsite backups of your account from 7 consecutive days to guarantee no data will ever be lost. Siteground is considered as best hosting company. With our Hosting service you benefit from a LIFETIME GUARANTEE with Maintenance, Assistance, Trainning. If your website is not hosted by us, Maintenance, Assistance are available on request basis and billed considering the amount of hours needed. Do I need a Cpanel? What is that? Cpanel is only available if you opt for one of our hosting services. cPanel is a web based control panel tool which will help you manage your web hosting account through a web interface instead of a console. With cPanel you are able to accomplish many tasks. You can use cPanel for basic, everyday tasks like managing your email. Tasks like creating email accounts, resetting passwords, setting up mail forwarders are only some of the several tasks you can do trough Cpanel. You will have access to statistics about your website and usage. It’s the tool to fully managed your storage space as you want. We take no responsibility about any damage you may create on your website or emails following a wrong usage of your Cpanel. Your are not obliged to select a Cpanel Access to run your website so if you are tight with your budget you can request for this option later. We will manage everything for you but any change after our delivery must be charged at our hourly cost. Do I need an SSL certificate? What is that? The free TLS certificates provided by Let’s Encrypt are subject to their terms and conditions . If you need an SSL certificate issued by an authority who is not Let’s encrypt, please contact us to enquire the cost. If you opt for the option “Cpanel access” and considering the eventual mandatory requirement as could be a dedicated IP, an SSL certificate from a third party is a possibility also, although we don’t recommend it. When using a third party SSL certificate bought independently, you are responsible for implementing, maintaining and renewing the certificate. What kind of assistance, maintenance and guarantee you give with your hosting services? Ordinary maintenance of hosting systems is included in all our Website designing services if your website is hosted on our servers and you bought Maintenance, Assistance, Guarantee option. Ordinary maintenance includes any required update of the CMS, Theme/template, Plugin, component at the condition you didn’t modify any of the core files. It’s a bit like for a smartphone, if you root or modify it you will loose the guarantee. You can do any change on your website about your text, content, pictures etc but not to the structure. If you do it, we can’t be responsible for extra maintenance cost. The cost of maintenance activity on a site hosted within your Hosting Provider will be billed at 40$/hour or equivalent in your currency. Extraordinary Maintenance, even on our Server or within your hosting companies will be billed at 40$/hour. If you want to get a best Hourly rate, just buy our support/maintenance package. You can get with the best value package a rate of 17$/hour. Extraordinary maintenance jobs must have a prior written approval from you before starting. Extraordinary Maintenance can, but it’s not limited to, include update of your Website CMS platform (i.e WordPress, Joomla, Magento, Drupal, Opencart..) or update of any Module, Plugin, Component installed at the delivery date of your website if you have added or modify any new plugin or adding Css or custom code. Take into consideration that update of your website must be mandatory to protect our server against security threats. Our hosting partner Siteground must ask us to update your website in order to be allowed to remain hosted on their servers. If you don’t want to update your website, you are free to move it to other hosting company less regarding on security. In case your website is not updated and hosted with us, interruption and functionality issues must occurs. We are not responsible for such happenings. 30 min maximum of Skype call as well as 2 emails (answers to your technical questions related to your website) by month are included in all our website designing services when your website is hosted with us. That means a total of 6 hours of Skype assistance by year and 24 emails. If you don’t use your free allowance of Skype session and emails during a month, you can’t carry over them on the successive months. In the event you will require extra assistance over the free allowance,you may buy our Assistance/trainning packages. Low Cost Web Agency cannot accept responsibility for any alterations caused by a third party or by you occurring to the Client’s pages once installed. Such alterations include, but are not limited to additions, modifications or deletions. Sites NOT Hosted by Low Cost Web Agency: Should client decide to host their site on another server, Low Cost Web Agency Pvt. Ltd cannot guarantee the all elements of the site will work. You agree that your website is compliant when hosted on our servers. As part of our service we will transfer your website to your host. In case of any issue after the transfer of the website to your host, Low Cost Web Agency Pvt. Ltd will make a reasonable effort to research the problem on the foreign platform to let the client know what we think the problem is. However, we cannot take responsibility for problems caused by or on another hosting server, including but not limited to email, FTP, SSL, database, server software, and site security issues. If Low Cost Web Agency believes it will take a significant amount of time to fix the problem, we will advise the client before proceeding. In most cases, fixing problems on a foreign hosting server is billable. What is a Dedicated IP? Do I need it? If you want to understand the difference of a shared IP and a dedicated IP you must think that a dedicated IP is like a single and independent house to host your website meanwhile a shared IP will accommodate your website in an apartment of a building containing thousands of other apartments. This cost recurs annually. Dedicated IP is only available if coupled with one of our hosting package. You can’t buy stand alone dedicated IP. Dedicated IP is only available if your website, CMS, CRM, Landing page is hosted by us. It’s quite mandatory to have a dedicated IP when you run an Ecommerce website and it’s strongly recommended to have it for any serious website. A dedicated IP means that your site have an IP address not shared with any other website. a better protection for your email services. You emails will not finish in the spam folder of the recipients. should a shared IP get blacklisted, your dedicated IP is not affected. Google will look at your site always as a safe website. You show to google that you are serious with your business. Security is important for you and Google like it. Your website have a potentially faster search indexing and loading time. What is “Remove Credits” option? A link to Low Cost Web Agency will appear in either small type or by a small graphic at the bottom of the Client’s website. The Client also agrees that the website developed for the Client may be presented in Low Cost Web Agency portfolio. If a graphic is used, it will be designed to fit in with the overall site design. If you requests that the design credit must be removed, the opt for the option through the buying process. It’s a one time fee. Do you have a fair use policy for your hosting services? Yes we have a fair use policy. Our Fair Use Policy sets out certain limitations on the allocation of Server resources, aiming to allocate all our customers fair and adequate use of our hosting services. The fair use policy must be followed by all our customer with hosting services and most particularly by those having a Cpanel Access option. When using the Services, you will ensure that neither you nor any of your End Users make excessive use of the Server resources to Low Cost Web Agency’s detriment or that of our other customers. The term “excessive” is defined by our experience with similarly situated customers. Your account includes a control panel that provides statistics setting out your use of the resources associated with the Services. These statistics are the sole and exclusive method to determine whether your account has exceeded its allocated resources. Unmetered traffic (bandwidth) applies to your use of web pages only (html, php, etc. ), not to upload or storage of movies, pictures or music files. While we do not meter traffic, the maximum availability at any time will depend on current traffic usage and the technical specifications of our servers. It’s strictly forbidden to host on your server files who are not strictly connected to your website or web application. You can’t use our hosting services as a remote media library. If you have such needs contact us, we may suggest you alternative solutions. You agree that we have the sole right to decide what constitutes a violation of the Fair Use Policy and what is the appropriate severity of any corrective action to be applied. Failure on your part to maintain your account in full compliance with the Terms & Conditions may result in warning, resource usage limitations, suspension or immediate account termination with no refund. You understand and agree that in the event of violation of the Fair Use Policy, we may provide you with a certain period of time to correct the issue. If you take no action during this period, we may apply corrective actions at our sole discretion. You acknowledge that we can immediately suspend and/or terminate each account that violates the Fair Use Policy and will not be responsible for any data loss resulting from such termination of Services. What are the elements I need to give you for my website and how I submit them? To build your website, we need to collect from you informations regarding the structure of the website you want, the menu title, your logo if you have one, the text of the pages and the products if we are doing an Ecommerce website. You must also let us know the name of the domain you want to use, the credentials to access to your hosting if you decide to host your site on your own, what are the email addresses we want us to configure for you. According the option you decide for there is a list of information that we will ask you. The traditional process meaning the use of email to exchange this kind of information is not efficient at all. To facilitate your digital journey and the process of exchanging data between us, we use the Visual tracking platform from our partner Trackduck/Invision. You website will be build on a demo server where we will be able to interact with your visually. Each element of the temporary website who need to be replaced with your content will be visually indicated on your screen allowing you to submit directly all your content and indication. Check Trackduck website to see all the advanced features we offer to efficiently build your website exactly as you want. The use of trackduck is free for you. We sustain all the cost because we are convinced that is the best way to build your website let you interacting with us at any moment directly on the demo website. What if I want a Design from Scratch? All the products available to be bought online are based on Premium pre-made templates. This is the most economic solution and it’s suitable for 98% of our customers. However if you need and unique and from scratch design, we will be happy to create it for you. Our creative director will follow your project involving talented designers. If you are interested you must contact us for a custom quotation. According to the kind of job and the level of your budget, we will assign the adequate creative team. You must consider at least a price of 1500$ for a very simple website with a design from scratch. Meanwhile products from Visual design and Print categories may have designs from scratch for convenient prices. Some products as logo are always with design from scratch. Check into the description of the product. What you pay more when you ask for design from scratch is the number of proof and modifications we need to make to complete the project. Do you do Backups? What about security? Yes we do backups but you are responsible for maintaining your own backups with respect to your website and we will not be liable for restoring any client data or client websites except to the extent that such data loss arises out of a negligent act or omission by us. The backups done by us are only for recovery purposes. Those backups are for restoring a server cluster’s data in a situation where there is massive data loss or a security compromise. We keep your website up to date, and we scan for security threats. All our hosted websites have network- and sever-level protections in place against attacks. Siteground is a best-in-class hosting player when it comes to security. Read how you website is protected. When we deliver your website, we will send you a link to download a full backup of your site as the time it was delivered. You must keep carefully this digital copy by your own means. External Storage, Cloud, CD, USB key. You should also backup regularly your website locally on your own system in case you accidentally delete files from your website or experience other types of data loss. You can do it through your Cpanel Access if you opt for this option. If your website is built with WordPress then we highly recommend Automatics amazing backup service with this Free Plugin . We will install and configure it for free on your website. Please note that Backup made on your Hosting require you have enough free hosting space. It’s preferable to send your backup on Google drive or Dropbox. If you are looking for even more security for your website, Low Cost Web Agency offers, in partnership with the security leaders, different Cloud Automatic protection packages for the protection of databases, files and emails of the Customer. We take care of all the installation and configuration of your automatic backups on a secured cloud. Check out for more details our Security and Website Backup Products by Low Cost Web Agency. What is the difference between a “static” and a “dynamic / CMS” website? A dynamic web site or a Content Management System / Ecommerce platform is written using a server side scripting language, like php and uses a database like mysql. You have more options with such a web site. For instance, you have an area, a back office, a back end, where you can log in and change various parts of the site, such as adding information, images or products. This is because each page is constructed based on the information in a database, and the information in that database can be changed via a graphical admin interface. Dynamic sites can reduce ongoing maintenance costs if you don’t want to change things yourself with a webpage editor or with the HTML. They usually cost more to develop, as they require more complex coding and a content management utility needs to be developed to help you manage your website information. Another benefit of dynamic sites is that they allow you to change only the content of the site and not the design, so you will not be able to accidentally break the visual style of the site. They have other benefits when sites start to get very large, as they make data management much more efficient and your site more expandable. Static Website is a good and economic solution for Landing page and Specific Opt-in Page! What is a CRM? Which one is better? A customer relations management system put all the pertinent client information in one central location that is easy to update and easy to see when other’s updated. All communication can be kept in one spot, nothing gets lost and you can now see and share with the rest of your team. Many advanced features allow you to forecast your business and get analytics. If you opt for Zurmo ad example, you can use your CRM to send mass mails and newsletters to all your prospects and customers. Many CRM are only for Paid users with sometimes very expensive subscription. We believe in Opensource solutions. That’s why we only offer free CMS (Zurmo+Suite CRM). We will install and configure anything to run your CRM, importing all your contacts in your new platform. If you decide to use our hosting services to host your CRM, then we will give you a life time guarantee thanks to our continuous maintenance and assistance. May I know what is included in your Lifetime Guarantee? When you decide to get your website hosted by us, and you bought the guarantee option, you automatically benefit from lifetime guarantee. That means that any issue arising on your website will be repaired by our technical team without any extra fees. Our Lifetime guarantee is valid only if you didn’t modify the core files of your website or if didn’t do any change on the design structure from the time we deliver your website to you. It’s a bit like the guarantee you have on smartphone. If after your purchase and our delivery you decide to open your website, to change its component or to modify its core files, you loose our guarantee! For only few bucks you get a very strong hosting platform for your website coupled with Lifetime guarantee for your website. We are very proud to offer this valued Service level agreement at low cost! How much content you will add in my website? Articles, Post, Products, Pictures? Based on the type of website you bought, a certain number of page, product, post, slideshow will be designed by our team. This number usually is enough to go live with your website. We will teach you how to add further content to your website. You will be able to do it safely on your own at no cost after the website is launched. If you want us to design and add more content than part of our offers, contact us and we will give you a custom quote according to the kind and volume of extra content to be added. Even if you need a website with 300 pages and want us to upload all the content we can serve you. Contact us! Please check below the comparison for each kind of Website Design products we offer. Volume of content uploaded and designed by us is clearly indicated. WordPress Vs. Joomla Vs. Drupal? Which CMS is better? WordPress covers 95% of the needs. Its the most easy and suitable CMS for Small and medium Companies. In our opinion, it is the best choice for most of the websites e.g. Forbes, CNN, Sony, Disney, Bloomberg Professional , BBC AMERICA, The Rolling Stones, are only some of big companies using WordPress. Joomla is the best choice if you need to create a social Network, a Magazine/Media Portal, a classifieds website. Joomla is quite friendly users but it’s less intuitive than WordPress. Drupal is a very powerful CMS and very secure. It’s mainly recommended for techy owners and complex websites. We will recommend to use Drupal in very few cases. Low Cost Web Agency operates on WordPress, Joomla and Drupal. If you don’t have particular exigences, we will recommend you after your purchase which platform /CMS is the best choice for your website. You are always free to pick whatever CMS you want. Will my Website be Responsive and Mobile friendly? A responsive and mobile friendly website is not anymore an option today. Google Search will not show in top rankings websites which are not fully responsive and Mobile Friendly. So a part if you ask us for some old school design only for desktop users (highly improbable), we will provide always design that are adaptive to any mobile device. Can I see example of website templates? Who is Low Cost Web Agency? Will I have an invoice? Used by the content network, Cloudflare, to identify trusted web traffic. Stores the user's cookie consent state for the current domain. Preserves user session state across page requests. Set by LinkedIn when a web page contains an embedded "Follow us" panel. Remembers the user's submitted data when a comment is submitted in a blog post. The purpose is to auto-populate form fields for subsequent comments, in order to save time for the user. Registers a unique ID that is used to generate statistical data on how the visitor uses the website. Used by Google Analytics to throttle request rate. Registers a unique ID that is used to generate statistical data on how the visitor uses the website.